As the oldest extant classic of traditional Chinese medicine, its first word-for-word translation from Chinese to English is published by Beijing Foreign Languages Press, the first-rate publishing house in China responsible for introducing Chinese classic culture to the Western world. Published by Beijing Foreign Languages Press. Compiled roughly two thousand years ago, this great work forms the theoretical basis of TCM. As TCM's history developed over the millennia, nearly all significant medical works benefited from the enlightenment of this unparalleled book. Covering not only medicine but also philosophy, sociology, anthropology, military strategy, mathematics, astronomy, meteorology, ecology, The Medical Classic of the Yellow Emperor demonstrates that even in ancient times, people accomplished scientific achievements that are applicable, relevant, and innovative even in modern times. The world-famous medical masters and saints in the history of TCM such as Zhang zhongjing, Hua Tuo, Sun Simiao and Li Shizhen, who lived hundreds to thousands years ago, are greatly enlightened by the academic thoughts of The Medical Classic of the Yellow Emperor. All of them researched into this great book deeply and mastered the essence of this book and thus became the most famous practitioners of TCM in Chinese history. Therefore, more and more western scholars from all realms are attracted to research into this glorious work. The Chinese original of this English translation is the currently universal textbook of TCM universities and colleges in China. Extracting the essence of The Medical Classic of the Yellow Emperor, this well-edited English version is rendered in word-for-word pattern for the purpose of offering a perfect access to the Chinese sources. It is exciting to provide, through this faithful translation, an opportunity to more easily understand Chinese thought for foreign friends with an interest in TCM or Chinese culture. The translator is Dr. Zhu Ming. Born at Huaihua of Hunan province, China in 1968, he graduated from Hunan College of Traditional Chinese Medicine in 1991 and has been clinically practicing TCM ever since. His clinical focus is on the treatment of difficult and chronic diseases, influenced by my father's long clinical experience. Working assiduously for eight years, he has successfully translated The Medical Classic of the Yellow Emperor into English. This book is available in more than 100 countries over the world, including the American bookstore Redwing Company the biggest one in the world focusing on alternative medicine, the biggest online bookstore in the world Amazon.com in the USA, the Great Wall Books&Art in Los Angeles, the Cypress Book Company in San Francisco, the World Prostatitis Foundation, the American Medica Inc., the British Splut Health Site, the Australian China Books Company in Melbourne, the Canadian Health Information Resource, the Lau Clinic Bookstore in Poland, the Euronet Netherlands, the biggest bookstore in China, Beijing Xidan Bookstore, Guiling Bookstore, Shanghai Xinhua Bookstore, Jinan Huiwen Bookstore, etc. I am writing to you in the hope that you will be so kind as to help me with couple with my questions, that I had after reading your translation of Nei Jing in English. Nice book, good job!!! Could you tell me please why it is so big difference between even Chinese editions of Nei Jing? And you have an article 6.2.5 of Chapter 17 where you describe diagnostic using cubital skin, which I never saw before in other editions. Do you use this diagnostic and how useful it is? This is Guo Yufeng from Shanghai. I happened to come across your homepage, and I was amazed to find out the English translation of Huang Di Nei Jing. I was trained as a professional interpreter, and now I am operating a TCM clinic in the city. I admire your English so much that I'd love to have a copy of it. Yet I have searched over both the net and the physical bookstores in vain. I wonder if you can send me a copy, and quite beyond the book, I would like to welcome you in Shanghai to have a discussion as to how we can restore TCM to its past glory, a place it deserved. Excuse me, if I offended you something. Reading and translating of your book (into Russian) has given to me great pleasure. I have found in it answers to many my questions. Especially valuable, in this plan your commentaries and the annotations to the original text of the treatise. Also I have looked your site www.tcmtreatment.com and have found there a lot of very valuable information, including on plant drugs. I the doctor, am engaged acupuncture 5 years. In Western countries scholars and physicians are engaged in systematic and comprehensive study of TCM and have made rapid progress both in theory and in practice. Naturally, many of these researchers into TCM are interested in knowing its earliest sources, which have been rendered mysterious and enticing by their inaccessibility. It is unfortunate, but there are three significant cultural and linguistic barriers to easy understanding: between English language and Chinese language, between standard Chinese and TCM technical terminology, and between modern TCM terminology and archaic medical Chinese. Few of the westerners who have tried to stride over the three wide gaps have been able to successfully approach this attractive and exotic medical field. Hence, more culture brokers are needed who are sufficiently proficient in TCM, on archaic medical Chinese and in English, so that more Western people can receive adequate information about the origins of TCM. 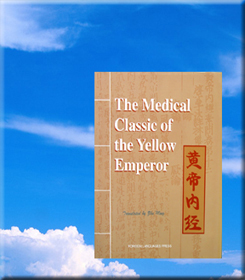 The Medical Classic of the Yellow Emperor (Huang Di Nei Jing), which is also translated by Ilza Veith as The Yellow Emperor's Classic of Internal Medicine (1966), is the oldest extant classic of TCM and the source of theory for this independent medical system. This book is written in the form of a dialogue in which the Yellow Emperor (the legendary first ancestor of the Chinese nation) discusses medicine with his ministers and some well-known doctors. No student of TCM in China could escape knowing about this text. I made my decision to translate The Medical Classic of the Yellow Emperor into English after I became a doctor of TCM from the Hunan College of Traditional Chinese Medicine and had undertaken clinical practice of TCM for many years. Fearing that my translation would do disservice to this great text, I proceeded meticulously in almost every step of my work, yet it was pushed forward slowly but surely by my loyalty to, and enthusiasm for, the masterpiece. A perfect version of the original text is a precondition for a satisfactorily translated product. I choose the textbook version of The Medical Classic of the Yellow Emperor as my original. It was edited by the Compiling and Checking Committee of Textbooks of State Universities and Colleges organized by the Ministry of Public Health of the People's Republic of China in 1982. The chief editor, Dr. Cheng Shide, is from Beijing TCM College. This textbook explains the original articles of The Medical Classic of the Yellow Emperor in a scientific, orderly and concise way. It is the unquestionably authoritative and consummate source. Annotations that quote explanatory notes of many famous ancient medical masters are presented as concisely as possible, while some necessary explanations are added. The structure of this book is to present the translations of an original article, or a section of dialogue, from The Medical Classic of the Yellow Emperor, followed by annotations and commentaries. This stable structure is intended to constantly clarify the reader's understanding. Sometimes, the original article and the annotations may convey a same concept in two different forms of expression. For example, the original article says, "Open the ghost gate and cleanse the clear fu-organ," while the annotation which follows says, "Diaphoresis and diuresis." The reason for the significant difference between the translation of the original article and the annotation is that, while words "diaphoresis and diuresis" present a readily recognizable gloss in Western medical terminology, a literal translation of the original text is closer to the expression accepted by practitioners of TCM in China and comes closer to reflecting the real meaning in the context of TCM conceptualization. Most of the original articles of The Medical Classic of the Yellow Emperor are quite terse. Hence, in order to make the translations of each article as close as possible to the Chinese language source, the annotations making the concepts and sentences more complete and clearer, and the commentaries summing up the gist of the articles, are usually indispensable. Literal translation, freely conveying factual information, is dependable and is the technique of translation adopted here. Many books have been successfully translated word-for-word into English and published in order to introduce TCM to the world. However, in an ordinary situation when an ancient classic of TCM is translated, dozens of experts from many fields take part in the work. First, professors of TCM interpret the book into current Chinese; then, professors of Western medicine, historians, linguists, anthropologists, etc., who have profound knowledge of English and Chinese, but not of TCM, translate this book into English. So, it is not difficult for us to imagine that errors due to different modes of thinking may occur. The different modes of thinking, different word usages, different styles and skills of translation, etc., may perplex readers. Western readers will frequently find inconsistencies in identifying concepts, just as if a man has five different names. The mistakes in disease names used in Western medicine will twist the facts fundamentally and confuse readers, especially among scholars of Western medicine. Thus, to translate verbatim is the best but hardest choice. The principle of literal translation penetrates the entire proceeding of my work. Unavoidably, some words have to be added or deleted on some necessary occasions in order to offer a correct and full understanding. All terms and concepts of TCM originate from the daily speech and activities of working people. It is easy to find their equivalents in English. English is based on people's shared experience in living, just as Chinese is. Therefore, English equivalents for terms in TCM can be determined. Generally speaking, any word that clearly conveys the true meaning of a Chinese term is acceptable. However, both Chinese and English have many synonyms, so a reliable and relatively stable system of terms is required. It is a matter for rejoicing that the system of terms is becoming more and more mature now in a universally recognized way after the efforts of many people from China and abroad. I have consulted many English books about TCM published in China and overseas. Of these, I tend to favor the work of the English enthusiast, Dr. Nigel Wiseman, who has made insightful and marvelous explorations in establishing the terminological system of TCM. It is worthwhile to mention that it is not wise for us to try to equate the terms of TCM to those of Western medicine, inasmuch as it usually leads to conceptual mistakes. In general, the anatomical terms are compatible. We had better avoid using the terms of Western medicine in TCM, especially using disease names, which often risks committing fatal mistakes, because TCM and Western medicine research the same entity from utterly different angles. I am confident that no expression in this book will seem too thorny when a foreign reader has grasped terms that frequently appear, such as qi , yin, yang, zang-organ, fu-organ, triple-warmer, nutritive qi, and defensive qi. A lucid English version, which even a foreigner without any knowledge of TCM and Chinese culture can understand with ease, is what I have done my utmost to produce. As we all know, science has no borders. TCM, the great treasure, should belong to the world's people. I am sure the comprehensive exportation of TCM will bring a brighter future to the health cause of the human race. Many sincere thanks are extended to Prof. Tong Yao and Prof. Yao Yong, working in Shanghai University of TCM now, for their instructive advice for modification. I also want to express my special gratitude to the international scholars of TCM, Prof. Stephen R. Smith of Wittenberg University in Springfield, Ohio, USA, Dr. Isabeau Volhardt, L.AC. of University of Washington, and Dr. Kim Taylor of University of Cambridge in England for their convincing and extensive revisions of my manuscript and their cordial encouragement. The English language is also corrected by Patti J. Tobin, Justin Sattin, Barry J. Grice, Volker Scheid, John Wm. Schiffeler, Gypsy Cole, Chao Yuang-Ling, Liu Xun, and Sun Ming, whose enthusiastic support for this project is admirable. The quality of the book would not have been improved without their generous help. Being impossible to be unassailable, this book eagerly awaits more criticism from all fields. 2.1 Fifth Article. Great Topic on Correspondences and Manifestations of Yin and Yang. Plain Questions. 2.2 Fourth Article. Discussion of the True Speeches of the Golden Cabinet. Plain Questions. 2.3 Sixth Article. Discussion of Separation and Combination of Yin and Yang. Plain Questions. 3.1 Ninth Article. Discussions of Zang-Organs and Manifestations Corresponding to Six. Plain Questions. 3.2 Eighth Article. Discussion of Secret Classic in Ganoderma and Orchid House. Plain Questions. 3.3 Eleventh Article. Discussion of Differentiations Among the Five Zang-Organs. Plain Questions. 3.4 Fifty-fourth Article. Natural Life-Span. Divine Pivot. 3.5 Fifty-sixth Article. The Five Flavors. Divine Pivot. 3.6 Thirty-third Article. Discussion of Seas. Divine Pivot. 3.7 Second Article. Basic Points. Divine Pivot. 3.9 Twenty-first Article. Discussion of Differentiations Among the Channels. Plain Questions. 3.10 Seventeenth Article. Measurements of the Channels. Divine Pivot. 3.11 Eightieth Article. Discussion of Great Puzzlement. Divine Pivot. 3.12 Thirtieth Article. Decisive Qi. Divine Pivot. 3.13 Eighteenth Article. Generation and Meeting of Nutritive Qi and Defensive Qi. Divine Pivot. 3.14 Thirty-sixth Article. Differentiations Among Five Metabolic Liquids. Divine Pivot. 3.15 Seventy-first Article. Dwelling of Evils. Divine Pivot. 3.16 Eighth Article. Root Spirit. Divine Pivot. 3.17 Forty-seventh Article. Root Zang-Organs. Divine Pivot. 4.1 Tenth Article. Channels. Divine Pivot. 4.2 Sixteenth Article. Nutritive Qi. Divine Pivot. 4.3 Seventy-eighth Article. Discussion of Nine Needles. Divine Pivot. 4.4 Fifty-first Article. Back Transport Points. Divine Pivot. 4.5 Sixtieth Article. Discussion of Holes in Bones. Plain Questions. 4.6 Thirty-eighth Article. Unfavorableness, Favorableness, Thickness, and Thinness. Divine Pivot. 4.7 Seventeenth Article. Measurements of the Channels. Divine Pivot. 4.8 Twenty-first Article. Diseases with Chills and Fevers. Divine Pivot. 5.1 Third Article. Discussion of Vital-Qi Corresponding to the Heaven. Plain Questions. 5.2 Forty-sixth Article. Five Variations. Divine Pivot. 5.3 Sixty-sixth Article. The Beginning of the Hundred Diseases. Divine Pivot. 5.4 Fifty-eighth Article. Bandit Wind. Divine Pivot. 5.5 Thirty-ninth Article. Discussion of Enumeration of Pain. Plain Questions. 5.6 Seventy-fourth Article. Great Topic on Supreme Truth and Importance. Plain Questions. 5.7 Forty-fourth Article. A Day Is Divided into Four Times in Accordance with Heavenly Qi. Divine Pivot. 5.8 Nineteenth Article. Discussion of Jade Arcana and Genuine Zang-Organs. Plain Questions. 6.1 Thirty-first Article. Discussion of Febrile Diseases. Plain Questions. 6.2 Thirty-third Article. Comment on Discussion of Febrile Diseases. Plain Questions. 6.3 Sixty-first Article. Five Contraindications. Divine Pivot. 6.4 Thirty-eighth Article. Discussion of Cough. Plain Questions. 6.5 Thirty-ninth Article. Discussion of Enumeration of Pain. Plain Questions. 6.6 Fifty-third Article. Discussion of Pain. Divine Pivot. 6.7 Forty-second Article. Discussion of Wind Diseases. Plain Questions. 6.8 Forty-third Article. Discussion of Impediment Diseases. Plain Questions. 6.9 Twenty-seventh Article. Whole-Body Impediment Disease. Divine Pivot. 6.10 Forty-fourth Article. Discussion of Atrophy Diseases. Plain Questions. 6.11 Forty-fifth Article. Discussion of Qi Reversal Diseases. Plain Questions. 6.12 Fifty-seventh Article. Water Distention. Divine Pivot. 6.13 Sixty-first Article. Discussion of Water and Heat Points. Plain Questions. 6.14 Fourteenth Article. Discussion of Soup and Wine. Plain Questions. 6.15 Forty-seventh Article. Discussion of Strange Diseases. Plain Questions. 6.16 Twenty-second Article. Madness and Mania. Divine Pivot. 6.17 Forty-seventh Article. Discussion of Strange Diseases. Plain Questions. 6.18 Forty-sixth Article. Discussion of Symptoms. Plain Questions. 6.19 Eighty-first Article. Yang Carbuncle and Yin Carbuncle. Divine Pivot. 6.20 Sixtieth Article. Jade Board. Divine Pivot. 7.1 Eleventh Article. Discussion of Differentiations Among the Five Zang-Organs. Plain Questions. 7.2 Seventeenth Article. Discussion of Profundity and Subtlety of Pulse Essentials. Plain Questions. 7.3 Eighteenth Article. Discussion of Manifestations of Pulse Qi of Healthy People. Plain Questions. 7.4 Nineteenth Article. Discussion of Jade Arcana and Genuine Zang-Organs. Plain Questions. 7.5 Forty-ninth Article. The Five Colors. Divine Pivot. 7.6 Seventy-seventh Article. Discussion of Five Omissive Errors. Plain Questions. 8.1 Seventy-fourth Article. Great Topic on Supreme Truth and Importance. Plain Questions. 8.2 Twelfth Article. Discussion of Befitting Different Methods. Plain Questions. 8.3 Sixty-fifth Article. Discussion of Transmissions of Tip and Root Diseases. Plain Questions. 8.4 Fifth Article. Great Topic on Correspondences and Manifestations of Yin and Yang. Plain Questions. 8.5 Seventy-fourth Article. Great Topic on Supreme Truth and Importance. Plain Questions. 8.6 Seventieth Article. Great Topic on Five Routine Rules. Plain Questions. 9.1 First Article. Discussion of Heavenly Truth in Ancient Times. Plain Questions. 9.2 Second Article. Great Topic on Adjusting Spirit According to Qi of the Four Seasons. Plain Questions. The Medical Classic of the Yellow Emperor is one of the earliest books found in the corpus of traditional Chinese medicine (TCM). It enunciates the systematic structure of the theoretical system of TCM and reflects the theoretical principles and academic thoughts associated with it. This theoretical system has formed the basis for development of TCM since its establishment. Nearly all academic thoughts of many well-known medical masters and medical schools appearing during the history of TCM have grown out of the theoretical system of The Medical Classic of the Yellow Emperor. Consequently, it is one of the basic theoretical curriculums of TCM today. All medical theories come from practice and, in turn, direct practice. Throughout the millennia, the great contributions by TCM to ensure the well-being of Chinese people depended on the theoretical system of The Medical Classic of the Yellow Emperor. Therefore, it received lavish attention from medical practitioners throughout Chinese history and was venerated as an ancestral work of physicians, not to mention being a compulsory classical work in TCM. Many historians and physicians throughout Chinese history studied and verified that the major contents of The Medical Classic of the Yellow Emperor had appeared in the Warring States (475 BC - 221 BC). It had been added during the Qin Dynasty (221 BC - 206 BC) and Han Dynasty (206 BC - 220 AD), and had been compiled to the public at the early time of the Western-han Dynasty (206 BC - 24 AD). The Yellow Emperor is the legendary first ancestor of the Chinese nation, and many Chinese people are proud of being regarded as his offspring. Many Chinese living in earlier times ascribed all their culture to him. This book was titled with his name in order to lead it to fame and authority. The academic divergence of thoughts in this book sufficiently indicates that it is neither a work of a single individual, nor medical achievement of a certain period or a local region, but rather the summarization of experiences of many medical practitioners over a long time. The currently universal version of The Medical Classic of the Yellow Emperor encompasses two parts, the Plain Questions and Divine Pivot. Each part has eighty-one articles. Thus, the book is composed of one hundred and sixty-two articles. The compilation of The Medical Classic of the Yellow Emperor established the unique theoretical system of TCM, and formed the basis for the development of TCM. According to the development regularity of medicines and the inference from the theoretical contents of The Medical Classic of the Yellow Emperor, this distinct system is based on anatomical knowledge, and directed by ancient philosophical thoughts. It was produced after long observation of life's phenomena, and proved repeatedly through medical practice. It developed gradually to form from perceptual cognition to rational knowledge and from scraps to comprehensiveness. Therefore, the theoretical system described in this work is under the guidance of ancient plain materialist dialectics, combining with the regularity of human life's activities. This system also presents a lot of significant theoretical principles and academic thoughts. They are also ideological ways that we must master when we study The Medical Classic of the Yellow Emperor. This theoretical system has two typical features, i.e., plain materialist dialectics and integral idea that man and nature are mutually corresponding. a. The "essential qi" is the source of the generation and formation of everything. The ancient Chinese philosophers regarded that the source of the cosmos was the essential qi. Everything in the world was produced by the essential qi, namely, original qi. The qi is an invisible materialistic element that forms everything. Of course, the "everything" also encompasses the human beings. Man is endowed with the essential qi from nature, and it is called qi, essential qi, vital qi, or original qi. The concept of qi permeated the medical field. Thus, the idea that everything consists of qi is inevitably shown in The Medical Classic of the Yellow Emperor. The qi is not only the basic material that forms the body, but also the dynamic power of the body. The life's activities of human beings are the manifestations of movements of the qi. Different combinations of the qi may generate different things. So, according to different places and different functioning of the qi, different names of qi are determined, such as true qi, ancestral qi, nutritive qi, defensive qi, liver qi, spleen qi, heart qi, etc. b. The materialism is highlighted. Prevailed the theories of yin-yang and the five elements in plain materialist dialectics, which were used to explain the changes of nature in the Spring and Autumn Period (770 BC - 476 BC) and Warring States Period (475 BC - 221 BC). It let more people become suspicious of the religious superstitions toward gods and ghosts. Life science was led to the realm of materialism. c. The proposition that life is antagonistic and united is prominent. Not only the body's structures but also life's activities are antagonistic and united, and too are man and nature. Everything has its two antagonistic and united sides, i.e., yin and yang. The antagonistic and united movements of the yin and yang push everything to develop forward incessantly, originating birth and death of everything. The Medical Classic of the Yellow Emperor was compiled over two thousand years ago. The language used in this book is archaic and laconic, and its expressions are gracious, far-reaching, and abstruse. The time when it was written is very distant. The book was copied again and again by hand. In ancient times people wrote on bamboo slips which were then tied together. Over the years the binding would sometimes fall apart and the slips would smudge or break. Therefore, pieces of the original text might become mixed up, incomprehensible or incomplete. This history gives us some difficulty in trying to study The Medical Classic of the Yellow Emperor. In this book, all the contents of The Medical Classic of the Yellow Emperor are arranged in eight chapters, except for "acupuncture" and "five movements and six climatic qi." The eight chapters are respectively the yin-yang and the five elements, zang-organs and manifestations, channels and network-channels, pathogens and pathomechanisms, diseases and symptoms, diagnostic methods, therapeutic principles and methods, and health preservation. Thanks so much for your concern and reading!